How the Universe Works is a documentary science television series that originally aired on the Discovery Channel in 2010. The first, fourth, fifth and sixth seasons were narrated by Mike Rowe and the second and third by Erik Todd Dellums. The first season, broadcast from April 25 to May 24, 2010, was released on Blu-ray on February 28, 2012. Since its second season, consisting of eight episodes broadcast between July 11 and August 29, 2012, the show has aired on The Science Channel. The third season aired between July 9 and September 3, 2014. The fourth season premiered on July 14, 2015, as part of the Science Channel's "Space Week," in honor of New Horizons′ flyby of Pluto that day; the season ran through September 1, 2015. The show′s fifth season aired from November 22, 2016, through February 7, 2017. The sixth season premiered on January 9, 2018 through March 13, 2018. The seventh season premiered on January 8, 2019 through March 12, 2019. New discoveries reveal that Earth and the planets were formed from the destruction of strange alien worlds. Mercury is a deadly world, facing attacks from the Sun, comets, and other planets, and even though it's the smallest planet in our solar system, it has a dangerous secret that might one day threaten life on Earth. Neutron stars are strange and violent phenomena that defy the laws of physics, and new discoveries reveal that these bizarre nightmares are far more deadly than we ever thought, with the power to destroy planets and even other stars. Interstellar space is the space between the universe's stars and new discoveries reveal that it's not empty and unremarkable as previously thought, but filled with weird objects and strange phenomena that might hold the darkest secrets of our cosmos. Black holes aren't the violent monsters we think they are, and new discoveries reveal that they might have been essential to creating stars, giving light, and building the universe itself. New discoveries are causing astronomers to question if the Big Bang really happened, and using the latest science, they investigate if it wasn't just the start of our universe but many mysterious multiverses. Dark matter and dark energy are locked in an epic battle for control of the cosmos, and the winner will determine the fate of the universe. New discoveries might reveal which force will emerge victorious. The latest discoveries suggest that we might be on the verge of discovering life beyond our planet, and scientists are investigating if earth's life began elsewhere in the universe, and whether we need to evolve to know for sure. For twenty years, NASA's Cassini spacecraft revealed the strange secrets of Saturn until it vaporized in its atmosphere in a blaze of glory. But today its legacy lives on, as fresh data from the probe helps scientists make brand-new discoveries. ^ "How the Universe Works Videos". Discovery Channel. Archived from the original on August 22, 2010. Retrieved September 3, 2010. 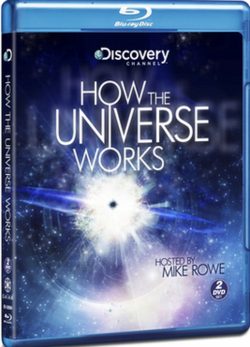 ^ "How the Universe Works Blu-ray". Amazon.com. Retrieved April 8, 2012. ^ "How the Universe Works Season 2". The Science Channel. Retrieved July 14, 2012. ^ "How the Universe Works listings on TheFutonCritic". Retrieved 10 July 2014. ^ "How the Universe Works S02E03 Planets from Hell". 7 September 2015. Retrieved 1 November 2016. ^ "Exoplanets From Hell - Life In Other Planets In The Universe (Documentary)". 13 December 2015. Retrieved 1 November 2016. ^ "Extinction". 13 August 2014. Retrieved 15 November 2016. ^ "Watch Online How the Universe Works Season 3 Episode 6 - Weapons of Mass Extinction". Retrieved 15 November 2016. ^ " "Did a Black Hole Build the Milky Way?". Retrieved 6 March 2018. ^ Mitch Metcalf. "Top 150 Tuesday Cable Originals: 1.9.2018". Showbuzz Daily. Retrieved January 9, 2018. ^ Mitch Metcalf. "Top 150 Tuesday Cable Originals: 1.16.2018". Showbuzz Daily. Retrieved January 16, 2018. ^ Mitch Metcalf. "Top 150 Tuesday Cable Originals: 1.23.2018". Showbuzz Daily. Retrieved January 23, 2018. ^ Mitch Metcalf. "Top 150 Tuesday Cable Originals: 1.30.2018". Showbuzz Daily. Retrieved January 30, 2018. ^ Mitch Metcalf. "Top 150 Tuesday Cable Originals: 2.6.2018". Showbuzz Daily. Retrieved February 6, 2018. ^ Mitch Metcalf. "Top 150 Tuesday Cable Originals: 2.13.2018". Showbuzz Daily. Retrieved February 13, 2018. ^ Mitch Metcalf. "Top 150 Tuesday Cable Originals: 2.20.2018". Showbuzz Daily. Retrieved February 20, 2018. ^ Mitch Metcalf. "Top 150 Tuesday Cable Originals: 2.27.2018". Showbuzz Daily. Retrieved February 27, 2018. ^ Mitch Metcalf. "Top 150 Tuesday Cable Originals: 3.06.2018". Showbuzz Daily. Retrieved March 6, 2018. ^ Mitch Metcalf. "Top 150 Tuesday Cable Originals: 3.13.2018". Showbuzz Daily. Retrieved March 13, 2018. ^ Mitch Metcalf. "Top 150 Tuesday Cable Originals: 1.8.2019". Showbuzz Daily. Retrieved Jan 8, 2019. ^ Mitch Metcalf. "Top 150 Tuesday Cable Originals: 1.15.2019". Showbuzz Daily. Retrieved Jan 15, 2019. ^ Mitch Metcalf. "Top 150 Tuesday Cable Originals: 1.29.2019". Showbuzz Daily. Retrieved Jan 29, 2019. ^ Mitch Metcalf. "Top 150 Tuesday Cable Originals: 2.12.2019". Showbuzz Daily. Retrieved Feb 12, 2019. ^ Mitch Metcalf. "Top 150 Tuesday Cable Originals: 2.19.2019". Showbuzz Daily. Retrieved Feb 19, 2019. ^ Mitch Metcalf. "Top 150 Tuesday Cable Originals: 2.26.2019". Showbuzz Daily. Retrieved Feb 26, 2019. ^ Mitch Metcalf. "Top 150 Tuesday Cable Originals: 3.5.2019". Showbuzz Daily. Retrieved Mar 5, 2019. ^ Mitch Metcalf. "Top 150 Tuesday Cable Originals: 3.12.2019". Showbuzz Daily. Retrieved Mar 12, 2019.